There’s a BLOG here! I’ve been a neglectful blogger, I know. In my defense… um… yeah, I got nothing. I have been working on the 2nd baby quilt and the last Baby Bolero, both of which need to be done before we leave for Pittsburgh this coming Thursday (Yay!! Kennywood!!!). I got the strips for the blocks cut out Thursday night, after accidentally cutting the binding/border/backing fabric (the ladybug print) in 2-1/2″ strips instead of 3″. So, I made a frantic trip to JoAnn Fabrics yesterday, where they thankfully had some more of it. So, I should be okay on that. 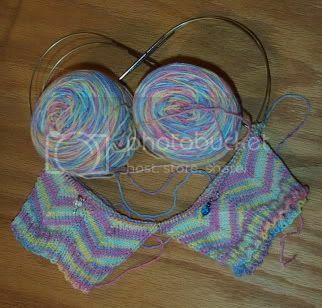 The body of the Baby Bolero is done, and the sleeves are started. So, I just need to finish them, sew them on, and pick up and knit the border. Not too bad, I hope. I am trying to decide if they are long enough to start the ribbing (which, knowing my patience for ribbing, will be less than an inch long). I think I am about there. Once the bolero and quilt are done, I’ll finish these up. 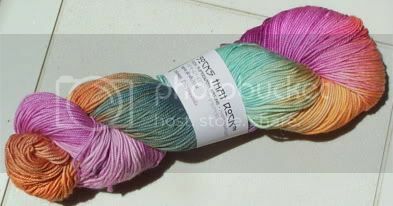 Then I can start on Kris’s Pirates of the Carribbean socks, which is totally what I am going to call the ones I am making out of the Lorna’s Laces Black Purl. 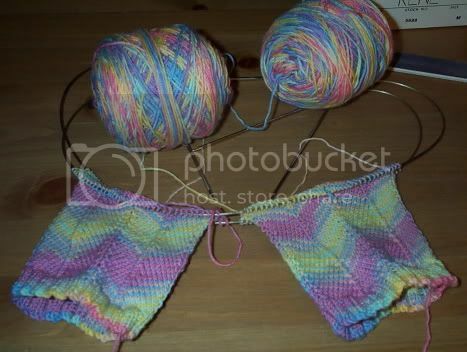 Maybe once those are done, I can finally start playing with my Socks That Rock, escpecially since package # 2 came in the mail today, and I haven’t even started on the yarn from the first package. So, wanna see the new color? I’ll put it as a link in case any other Club folks want to avoid it until their package arrives, but it is called Fairgrounds. Pics here and here. Let’s see… any other news? Oh, yes. Kris decided (brace yourselves, folks) that he wants to learn to spin! So, Tuesday evening, we went down to Springwater Fiber Workshop and he picked up his very own drop spindle and some bright blue Corridale roving. We haven’t actually started the learning just yet, but he’s kind of excited about it. Like, I’m thinking he may have his own wheel someday. Of course, he’s hoping to build it himself. He’s in the garage at the moment, doing some woodworking, and he did find plans for a number of spinning wheels and suchlike, so it might happen at some point. I’d love to see him be able to get to a point where he can make and sell them someday. I think that would make him very happy. Anyway, while we were in Alexandria, we decided to find someplace for dinner. We checked our GPS gadget to see what restaurants were closest, and we saw a name we couldn’t resist – Bilbo Baggins Restaurant. We are such geeks, we just couldn’t pass that up. Happily, we loved the place! It’s not very big, but the service was incredibly friendly, and the food was AMAZING. We are already talking about going there for dinner on our anniversary. 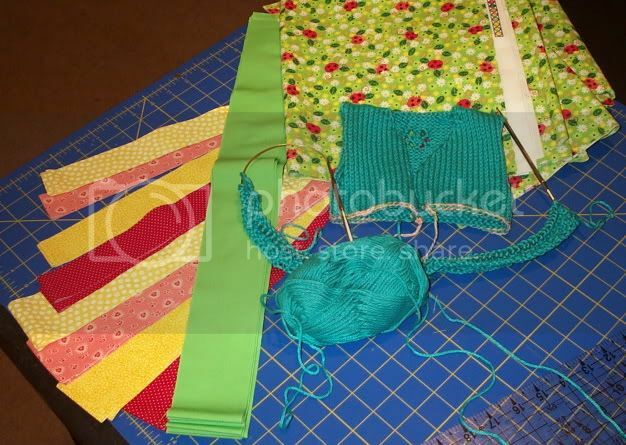 May 20th, 2006 | Tags: Gifts, Knitting, Planned Projects, Sewing, WIPs | Category: Misc. 7 comments to Whaddaya know? The fabric for the second quilt is too cute. Have a great time at Kennywood!! Wow, love the quilt colors. Is this your last BB for a bit? 😉 Yay, that would be so cool to have Kris build them, I think it is so awesome how involved he is and how he encourages you! Dinner sounded yummy! 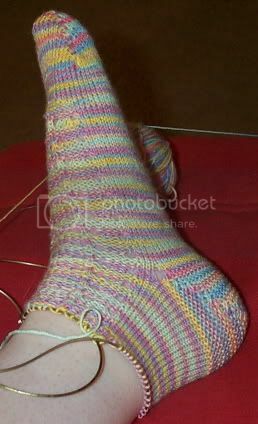 Oooh, love those socks! Can’t wait to see them finished. Have a safe trip! I love the new STR colorway! Hope the spinning works out well for Kris. We’ve all be neglfectful at times, so it’s okay we’ll forgive you. My eyes! My eyes! Get me some sunglasses! Get some self-tanner! LOL You know I’m just kidding. Cute socks!